The first weekend in March is fast becoming a standing date in the Slaughtneil diary. The Derry club are playing in their third consecutive All-Ireland Senior Camogie final and go into Sunday's decider as hot favourites. All that's standing between them and a third straight All-Ireland title is St Martin's, a Wexford side making their Croke Park debut. For Slaughtneil, the tables have turned - three years ago, they were the team who fought their way to a first ever club camogie final. They won at the first time of asking, beating Galway outfit Sarsfields by two points. 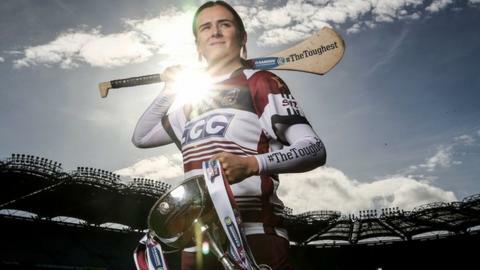 Every camogie journalist would say that Slaughtneil's well-worn road to finals gives the Emmetts the edge but joint-captain Siobhan Bradley is taking nothing for granted. "Certainly we have produced a standard, we've worked really hard to be where we are," she said. "There are teams just behind us and St Martin's are matching us at the minute. It's going to make for a really exciting All-Ireland final." Just like St Martin's, some of the fresh faces coming through in the Slaughtneil panel will have their first outing in Croke Park, with last year's final played in Clones after the game was twice delayed because of bad weather. Bradley added: "Obviously, there will be nerves. It's about remaining grounded going into this game. We aren't getting involved in the hype going on outside the camp." The hype around this team and the club of Slaughtneil is understandable. They have ripped up the record books when it comes to club competition in Ulster. In 2016, Slaughtneil became the first club to win provincial titles in Gaelic football, hurling and camogie in the same year. The club did it again in 2017 with the senior teams clinching provincial success in all three codes. Success is now synonymous with Slaughtneil and no team has reached bigger heights than the camógs. The old adage goes that success breeds success and Slaughtneil have big numbers in their underage programmes, with plenty of camogie's future stars first picking up a hurl having been inspired by the senior girls. When it's pointed out that some of the younger players won't know any different and must think that the club makes the All-Ireland final every year, Bradley laughs. "The nights that we come back to the hall after winning championships, it's amazing to see their delighted faces and how much it means to them. "Hopefully, they come through the generations and will be standing on that stage as well." What's the secret to Slaughtneil success? When it comes to the team talk before Slaughtneil run out on the Croke Park pitch, Bradley will be helped by co-captain Gráinne Ní Chatháin. Even after back-to-back finals, Ní Chatháin says they never expected to be vying for a third title on the bounce. "We never thought that at the start of this year to be where we are now. "We've put in a lot of work but to get to our third All-Ireland final in a row is unbelievable." What has puzzled camogie teams and their coaches for the past few years is the secret to Slaughtneil's run of form. St Martin's will have spent the lead up to the final analysing coverage of Slaughtneil's games against Ulster rivals Loughgiel and Galway champions Ardrahan. Manager Damian McEldowney has his playbook clutched tightly to his chest but will Slaughtneil be switching up their tactics for the final? "I'm a firm believer in if it isn't broken, don't fix it", says McEldowney. "We've trained the way we normally do, we've prepared for matches the way we always have. Nothing is out of the ordinary. "It's worked so far, we just need to get through one more game." With breakfasts organised and buses booked, the parish of Slaughtneil is buzzing ahead of another big day out for the south Derry club. Turning off the Glenshane Road, you see the maroon and white flags flying long before you reach the townland in the foothills of the Carntogher mountain. "I'm looking forward to it. I was never much of a hurler myself - I never dreamt of getting on the Croke Park pitch so to do it as the manager of these girls is very special. "When you get to this stage, you just want to get out and play the game." With so many county, provincial and All-Ireland titles behind them, the trophy cabinet is bound to be crowded and only time will tell if the Bill & Agnes O'Carroll trophy will be calling Slaughtneil home for one more year. "We'll have that thought on standby. We don't want to take our eye off the ball and start thinking we have anything won already," adds McEldowney. "We'll make room if it's coming up the road with us."